December 10, 2013 in Personal Stories. This is the third article in the series by Ani Rinchen Khandro published in the New Statesmanin which she relates her experience at the Kagyu Samye Ling Monastry in Scotland. If, after having encountered a realized spiritual master of authentic and unbroken lineage, one wishes to become a Buddhist the next step is to ‘take refuge’. In the Tibetan Buddhist tradition the spiritual teacher, who embodies the Buddha, bestows refuge and the student puts his or her wholehearted trust in the three refuges of the Buddha, the Dharma, (the Buddha’s teachings), and the noble Sangha, (the other enlightened ones). The Buddha gave thousands of different teachings and methods appropriate to the various kinds of beings. It is the teacher’s job to guide the student towards the most suitable teachings for their particular type of personality. However, they all have the same purpose which, in essence, is to overcome suffering and attain true happiness by refraining from negative acts and by practising virtue. We aspire to attain full realization of our innate Buddha nature so that we can help others do the same. That is the motivation behind all the study, meditation, prayer and other activities. Mornings at Samye Ling begin with prayers in the main shrine room at six AM. These are dedicated to Green Tara, a female aspect of Buddha who is particularly associated with fearlessness, swift, compassionate activity and protection from all manner of ills. We aim to cultivate those qualities within ourselves through prayer, mantra recitation, visualisation meditation and offerings. After breakfast there is an hour session of sitting meditation then at nine o’clock everyone goes to work wherever their daily jobs take them, whether in an office, kitchen, garden, workshop, art room, café or shop. A hearty vegetarian lunch is followed by more prayers then it’s back to work until five, when there is another meditation session. Supper is followed by evening prayers then the rest of the evening is free. As most people are quite busy with their work we are not expected to attend every prayer and meditation session of each day but just do our best, and try to go to at least one. It is up to the individual and how diligent they are. As with anything, the more you put in, the more you get out of it. The resident community of around seventy people is a mixture of ordained monks and nuns and lay people who work together to run the Centre. At weekends the numbers are swelled by guests attending a variety of courses in anything from mediation to tai chi, yoga and various therapies. There are also longer courses given by Tibetan High Lamas attended by hundreds of people from all over the world. Day visitors are also a regular feature and on any given day there is usually a school group or coach full of sight seers. Despite all this activity the temple remains an oasis of calm and the extensive grounds and Peace Garden with its beautiful stupa, statues, ponds and fountains provide a peaceful environment to delight the eye and restore the spirit. 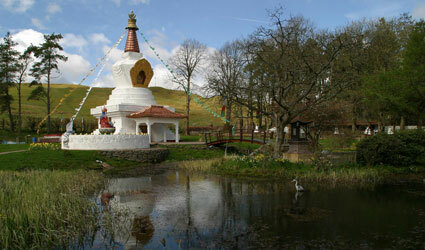 The very name Samye Ling means ‘place beyond concept’ so any description falls far short of the reality. Do visit our website to find out more, or better still, visit Samye Ling in person and experience it for yourself.